When I left home this morning I felt the summer was over (no doubt about that). So being able to write about my summer holiday (that seems soooo long ago) does bring a bit of sunshine back inside the home and an instant feeling of happiness. This summer it was the first summer we had to take during the school holidays . “Nothing special’ you might think, but it seems that if you don’t start booking your holiday a year in advance, finding free rooms is a true quest. So I decided to look for regions that are less touristy, but that still match with everything I have on my checklist. 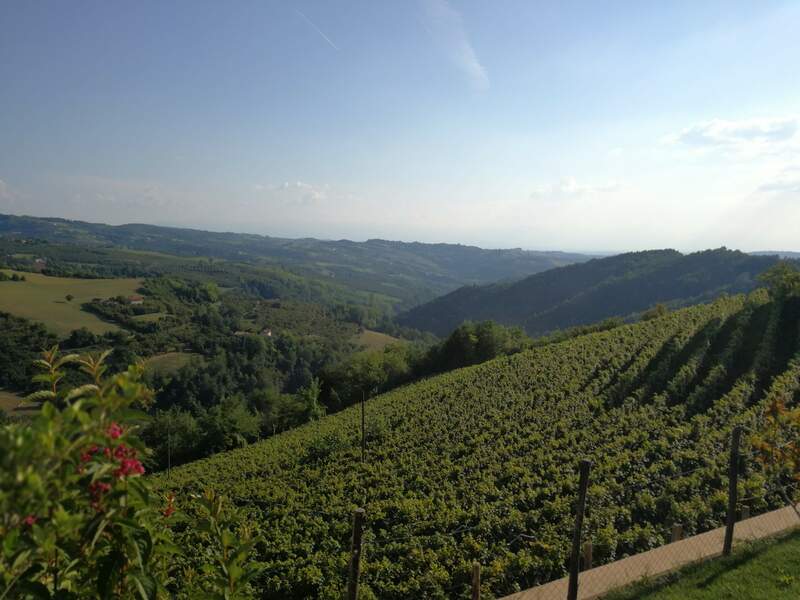 A region like this is Piemonte. 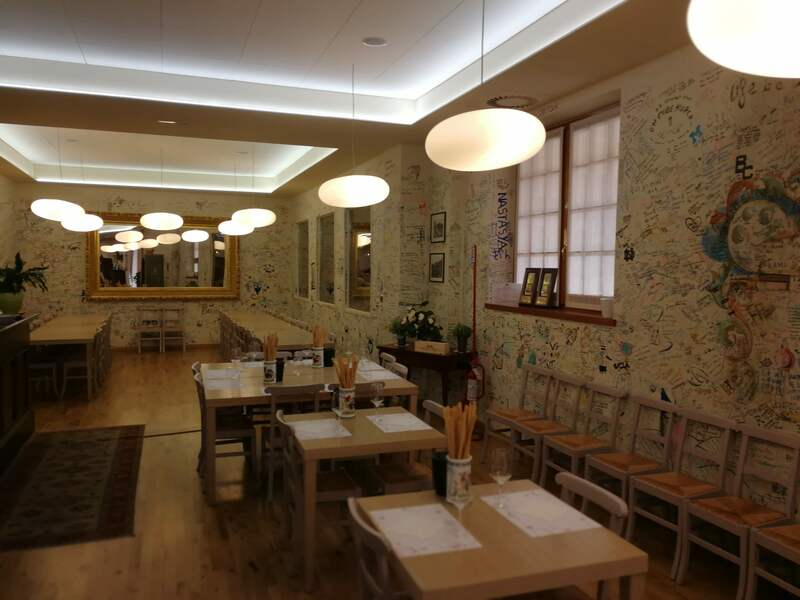 The region is as beautiful as Tuscany, is a gastronomical Walhalla (with it truffles, wines, etc…), has many beautiful cities and villages to visit and you can get around in this region without the lots of traffic you that you would find in Tuscany or the South of France. It is not my first visit to the region, but every time I come here I fall in love with it again… especially when you drive through Alba and you can smell when they are roasting the hazelnuts (mixed with chocolate smells) at the Ferrero factory (yes, where the Nutella is made (amongst other things)). The accommodation we stayed at is definitely a tip I want to share with you. We stayed at QB apartments in Montelupo Albese (just outside of Alba). 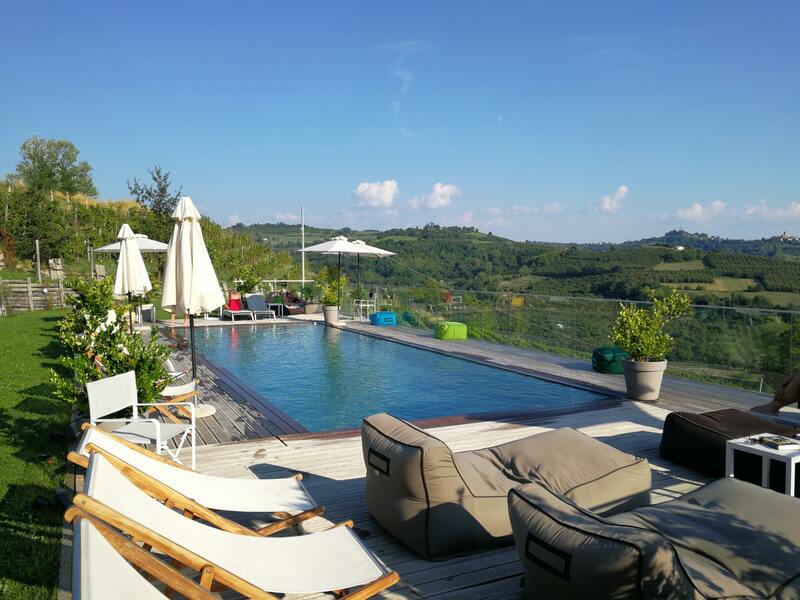 Apartments/studios with an incredible view over the hills of Langhe and its beautiful vineyards and all the comfort one needs designed by host himself who also happens to be an architect. On top of that you get the peace and quiet (maybe when my children were there a bit less 🙂 ). We chose an apartment as we liked to have the possibility to be able to cook ourselves as with small children it isn’t always ideal going to restaurants. Not that we didn’t go out for eating, but having the choice was very practical. 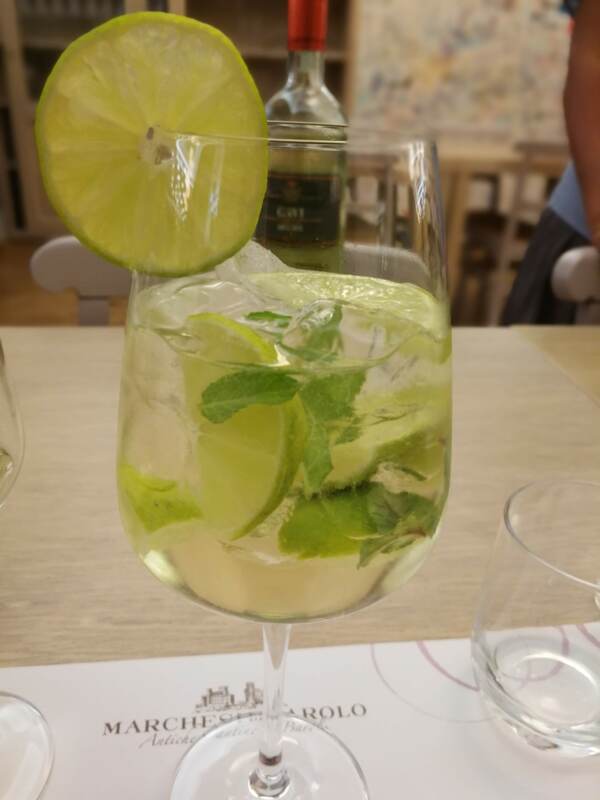 Going on holiday with small children does change a thing or two in things you can do (which is logical and I don’t mind adapting myself)… but when you are in one of THE most famous wine regions in the world, NOT visiting a vineyard is not an option. 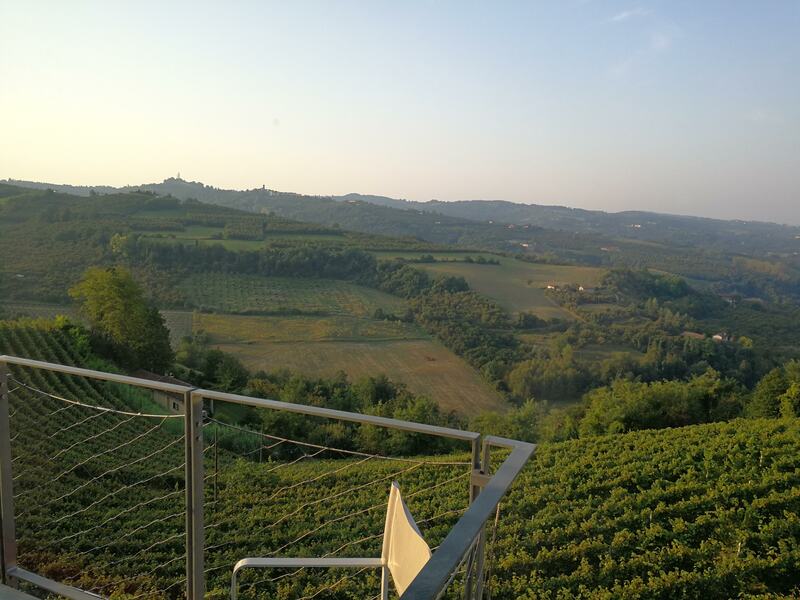 Luckily I have a wonderful wife who understands all of this (and I do all the holiday planning 😉 ) and I was able to visit 2 vineyards during our holidays in Piemonte. As I could only visit 2 I wanted to make sure the once I would visit were very good ones. 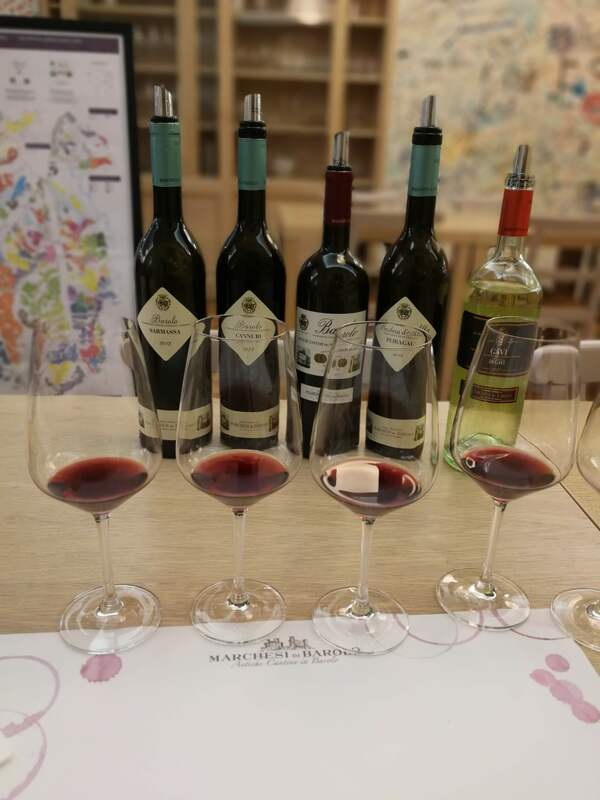 And so they were as I was fortunate enough to visit Marchesi di Barolo and the one and only Gaja. Both very well-known wineries, but both with a different view (and price range). At Marchesi di Barolo it was the lovely Lucrenzia who showed me around this historical winery. 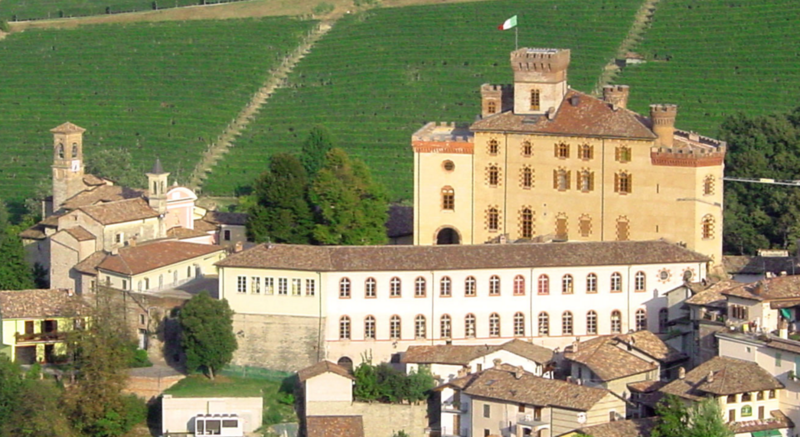 The cellars of Marchesi di Barolo are located in the heart of the village of Barolo, with views over the beautiful castle of Marquis Falletti. 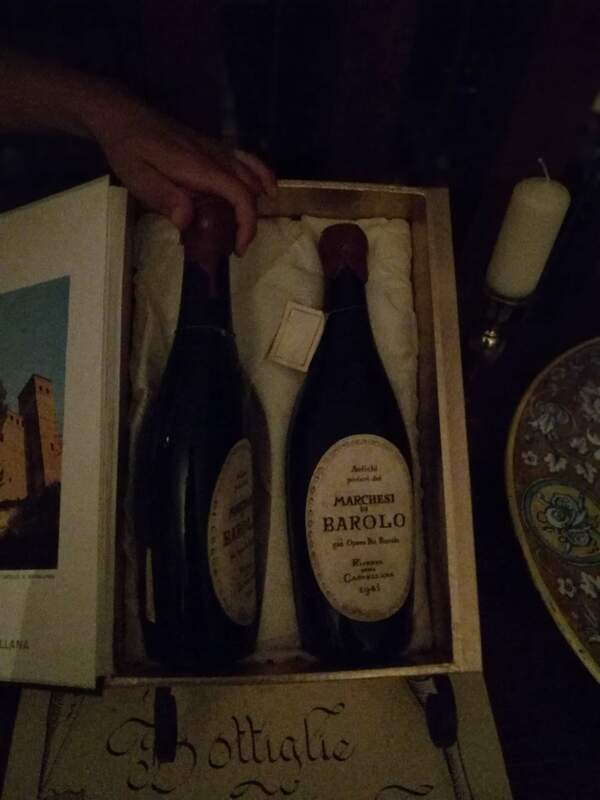 The world-famous wine Barolo is not only a ‘symbol’ of this region, but of the entire wine country of Italy. The Nebbiolo grapes for the Barolo Tradizione come exclusively from the best vineyards of Barolo, Monforte, Castiglion Falletto and La Morra. These vineyards are all located on the hills south of the city of Alba. 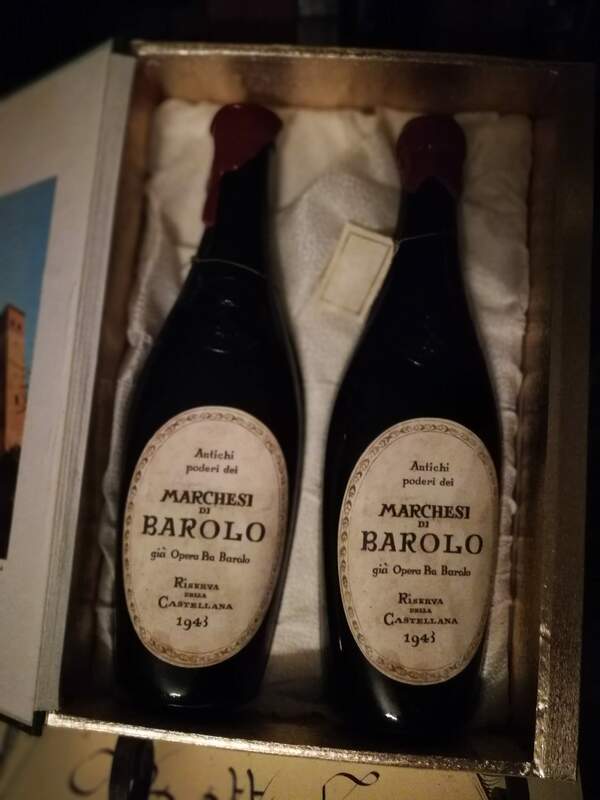 Me personally I know Marchesi di Barolo from the time my dad had his restaurant, as back then he used to sell (one of my favorite MdB wines) the Cannubi by Marchesi di Barolo. I don’t know if you guys are history lovers? I am one for sure!! I really enjoyed listening to Lucrenzia (who was telling it to me with that much passion I started thinking it was her winery) who took me on a magical path through history. 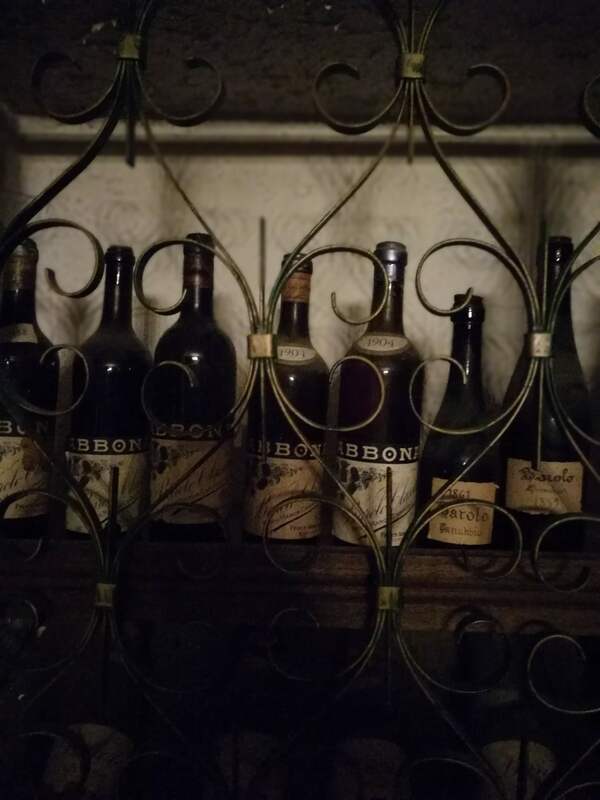 I was surprised that they still had so many old wines, including a bottle of 1895!! 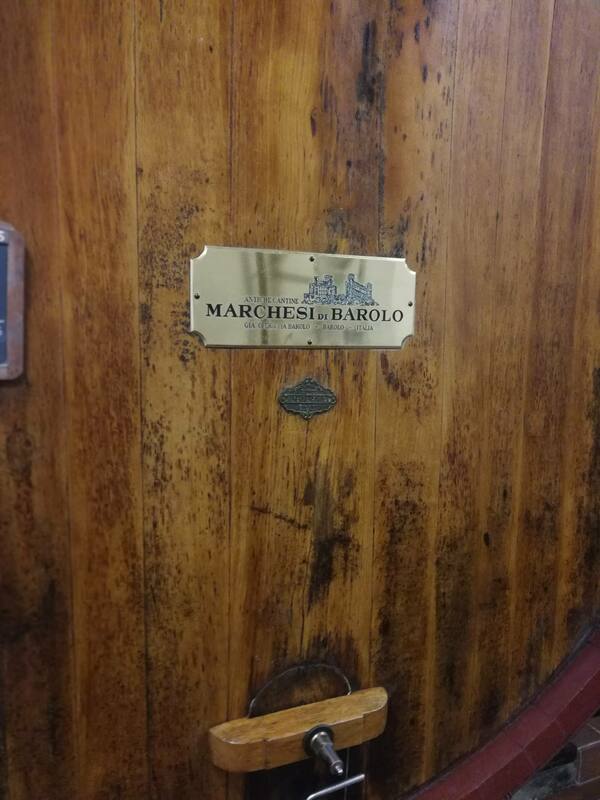 I was also surprised to hear that (Just like I had heard at Bouchard a few years ago) at Marchesi di Barolo, every 20years they check all the old wines and see if they are still drinkable. If they are they get a new cork and can wrest some more. 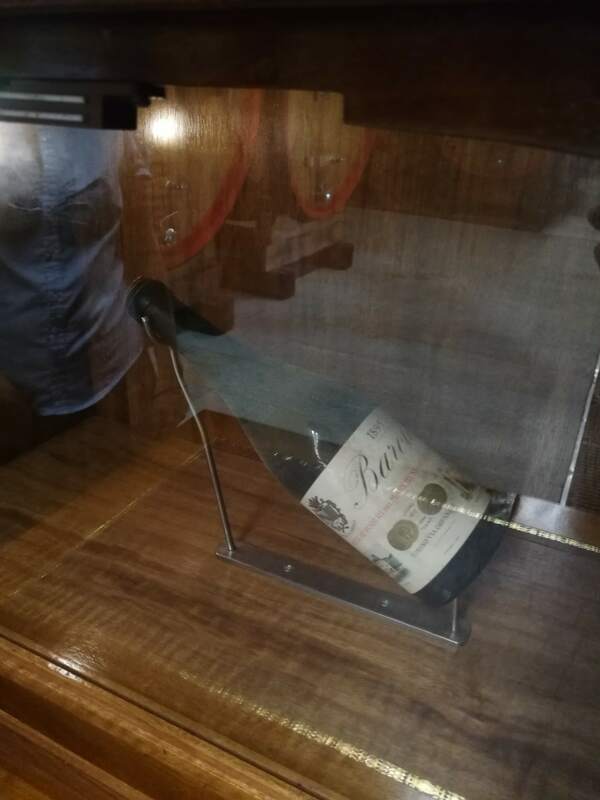 I was also told that sometimes for very special occasions they still open some of those old bottles for the public. I was however disappointed to find out my visit wasn’t one of those special occasions 🙂 🙂 (just kidding). 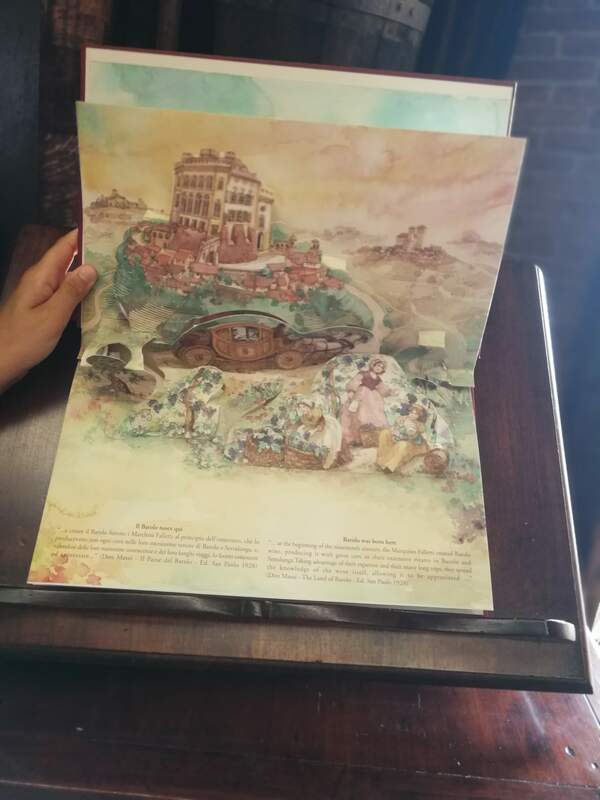 Something very charming to see was the special flip book they made to explain the history of Marchesi. Now some serious business, the red’s. 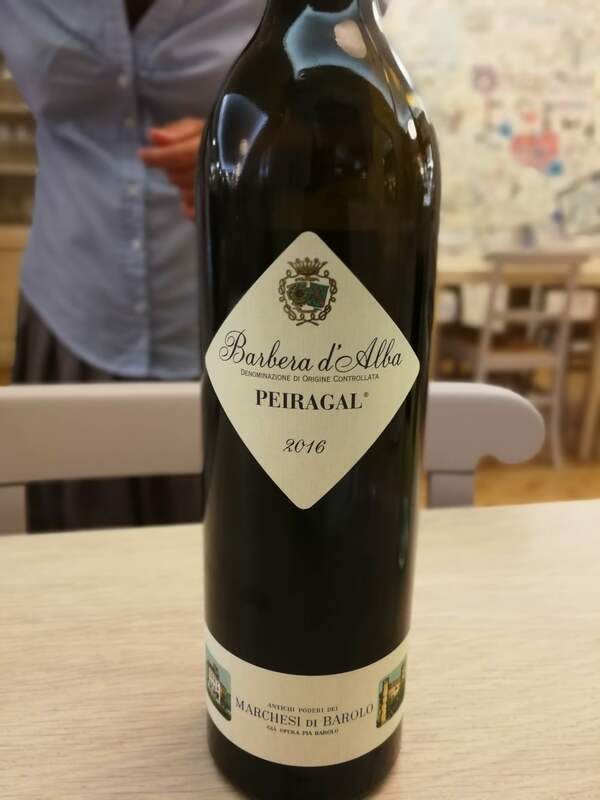 Although the region has some very nice white’s, the reds are the reason we come 😉 The first red to taste was a 2016 Barbera d’Alba ‘Peiragal’. From a commercially point of view Barbera today is one of the most import grape varieties in the area, however, the variety is not as old as some other varieties from Piemonte … Barbera has for a longtime been seen as a “less important” wine in comparison with the Barolo. BUT it now found its rightful place at the top. In terms of taste, you type Barbera the easiest in comparison with Nebbiolo. Barbera always has a rather deep color, very high acidity and moderate tannin, while Nebbiolo is just the opposite on these three levels. The “typical” style of Barbera has, however, been changed considerably in recent years by some producers by using certain wine making techniques. Often it is said the Barbera is female and Barolo Male 🙂 Not sure why that is actually, maybe because of its tempting fruitiness acidity? 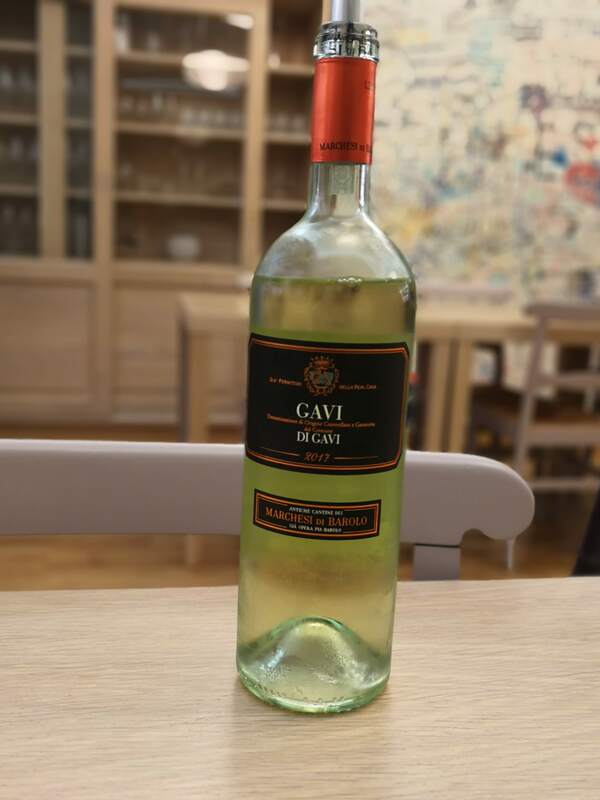 (it is also said it is the Merlot of Italy). As for the Peiragal (I sometimes get carried away) for me it is a warm, robust and full, ruby red wine with aromas of berries, hazelnut and hints of vanilla (not too much of the last). 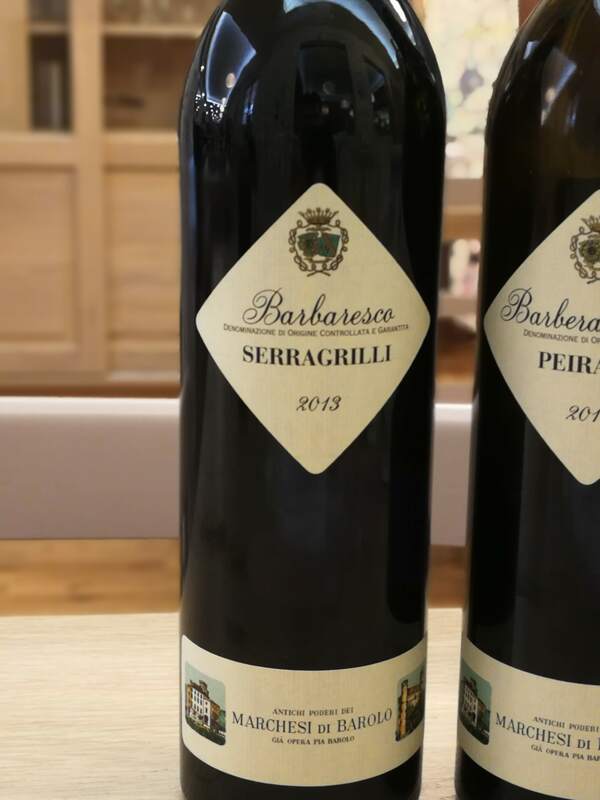 Up to the 2013 Barbaresco ‘Serragrilli’ that was one of my favorites of the tasting (if I can be picky, because the other ones were also fabulous). 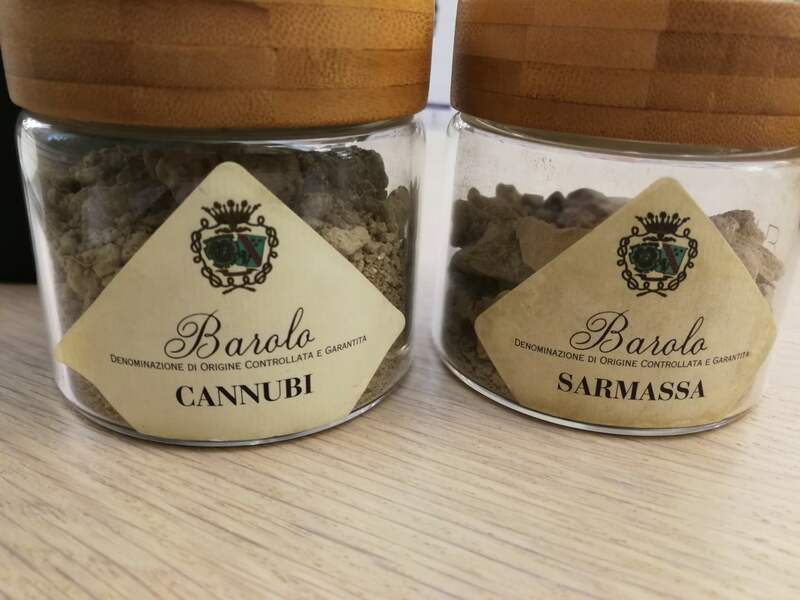 Probably because of the fact the Barbaresco is made 100% out of Nebbiolo grapes it is often compared with its nearby brother ‘Barolo’. But they both have different soils, different history and different rules of making the wine (in many ways also due to the difference in soil they grow on). 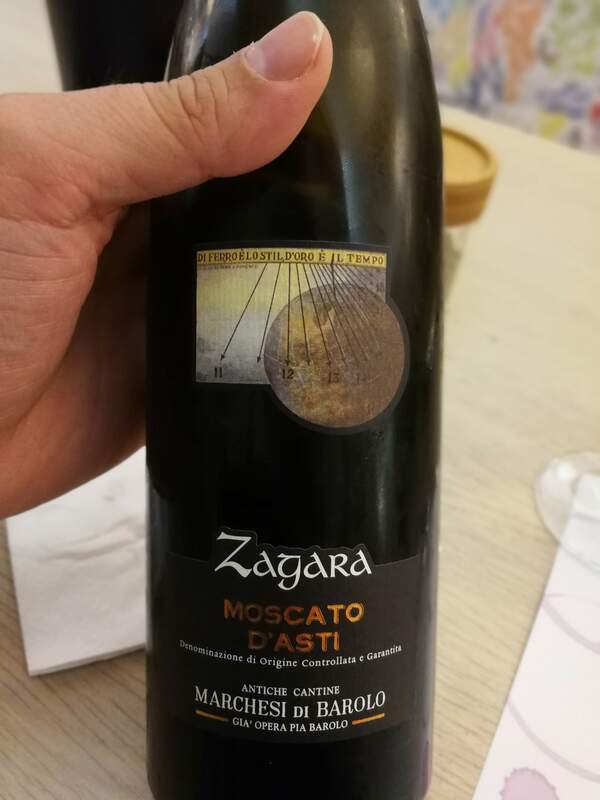 So basically they share the same grape and that’s it 😉 but in case you are very curious, this link might help to clarify a thing or two 🙂 BTW, the best way to actually know the difference is just tasting both next to each other (like I did at Marchesi). A solid, to the point wine, that opens with aromas ‘new leather’ (I know, but it really did), black cherry and a hint of oak-driven spice. On the palate I noticed dried black cherry, anise and a slightly bitter note. But what made it a winner for me was silky tannins, characterized by a long and fresh finish. A warm and full-bodied feeling in the mouth . Beauty!! 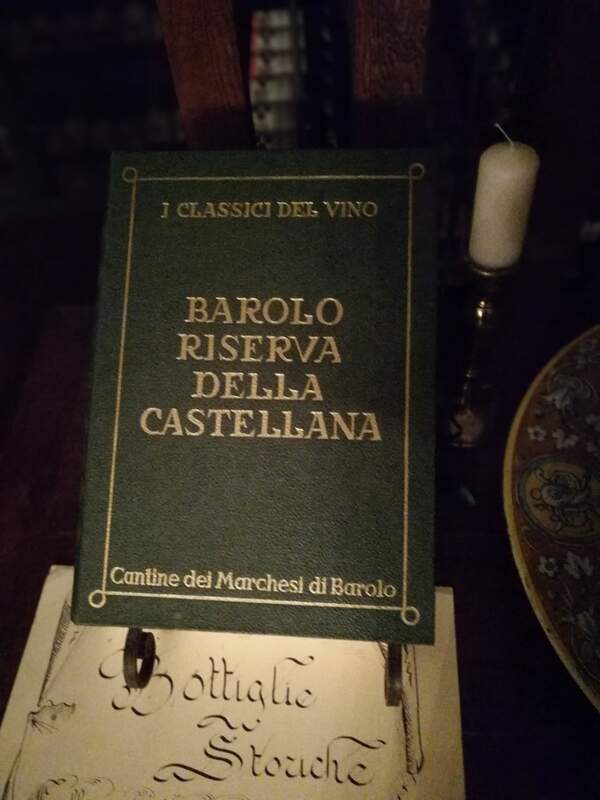 Now time for the Barolo di Barolo 🙂 😉 Not an official term, but hey, I’m drinking Barolo of Barolo in Barolo made by the Marchesi di Barolo … it won’t get more Barolo than this! 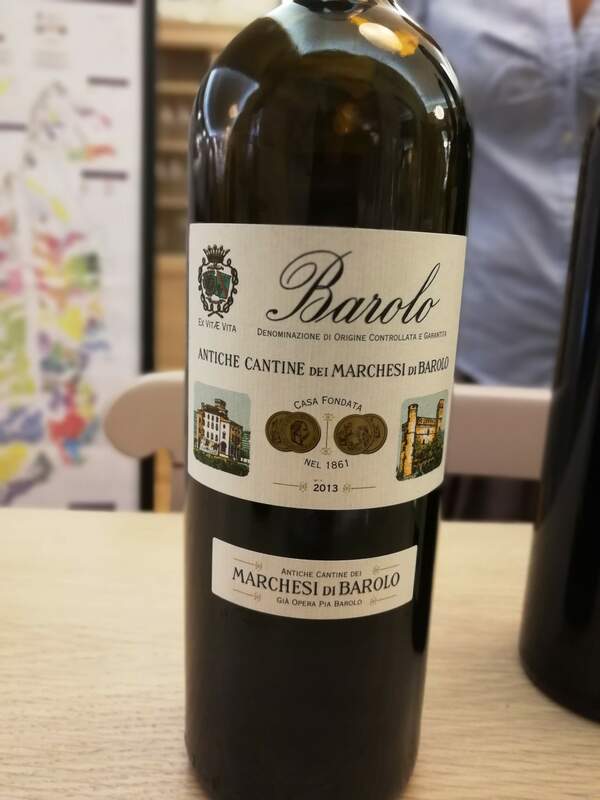 I tasted 3 of Marchesi’s 2013 Barolo’s: Barolo (Classic), Sarmassa and my beloved Cannubi. 3 wines made with the same grape, in ways similar but yet so different. Putting these 3 next to each other is the best example of when wines are cultivated in the same ways and produced in the same ways that the fact they come from a different soil makes them completely different!! Incredible. 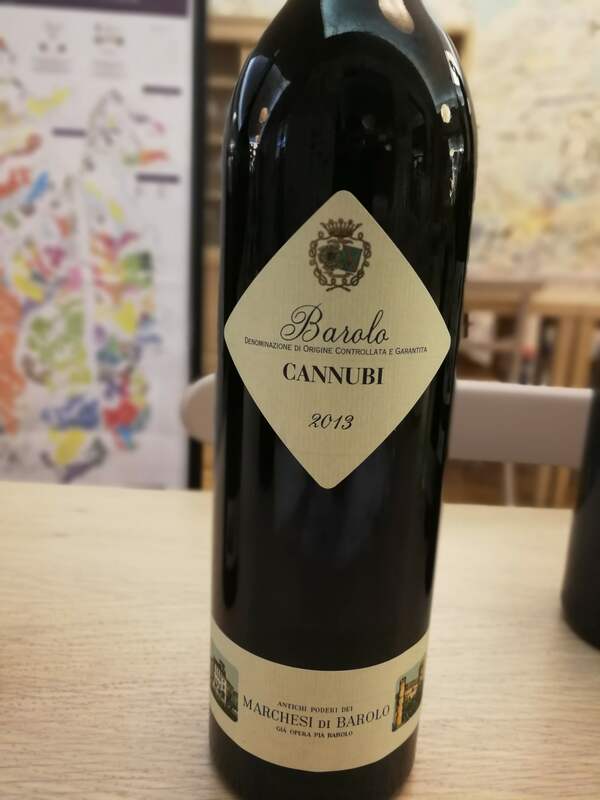 It already starts at the nose with the Cannubi being tight and focused with aromas of wild berry, red rose. 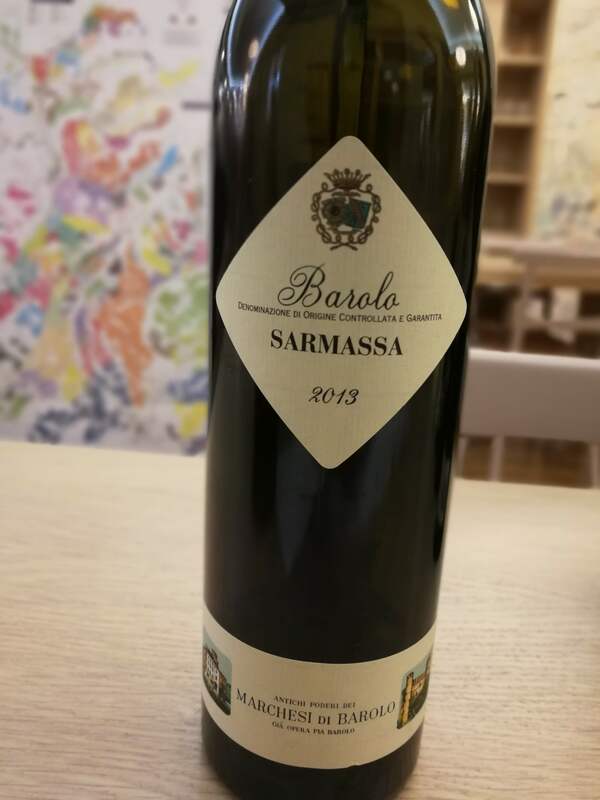 Whereas the Sarmassa gives more black-skinned fruit, coffee/toasty, dark spice and even balsamic notes and the “Barolo Tradizione” that is somehow ‘softer’ with the red-fruits but still the hints of coffee. All 3 with an incredible finish, but maybe all 3 might need some extra time …but nevertheless very drinkable now and a pleasure for the taste buds and the palate. Thank you very much Lucrenzia for this fantastic visit! !